Reflections of a Newsosaur: Are newspapers losing ‘mass media’ mojo? Are newspapers losing ‘mass media’ mojo? Print newspaper circulation has fallen to the lowest level since the 1940s and the lowest household penetration rate in modern history, raising the question of when a mass medium is no longer a mass medium. As discussed here last week, U.S. publishers now are selling between 38 million and 43 million newspapers on the average weekday vs. 41 million copies on the average day in 1940. Back in 194o, when broadcasting was in its infancy and print was the state-of-the-art source for news and shopping information, Americans on average actually consumed more than one newspaper per day. 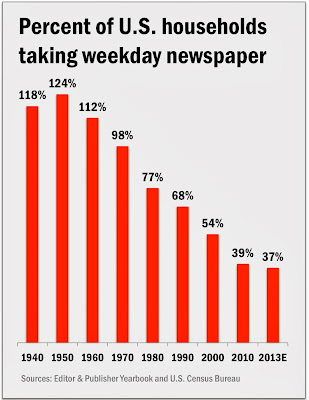 Consequently, the number of newspapers sold in 1940 equalled 118% of all households and actually rose to 124% in 1950. 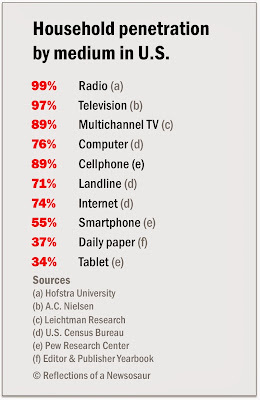 Of course, newspaper content is no longer consumed in print alone. 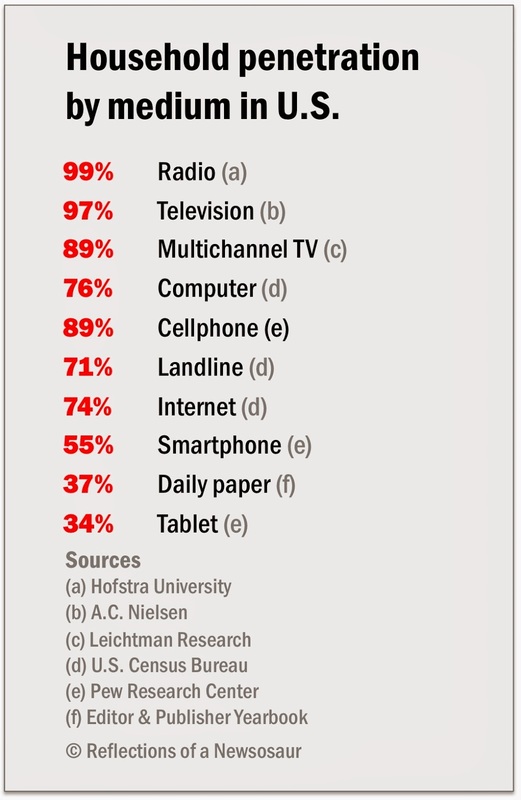 News and advertising produced by newspapers are widely consumed on computers, mobile phones and laptops. 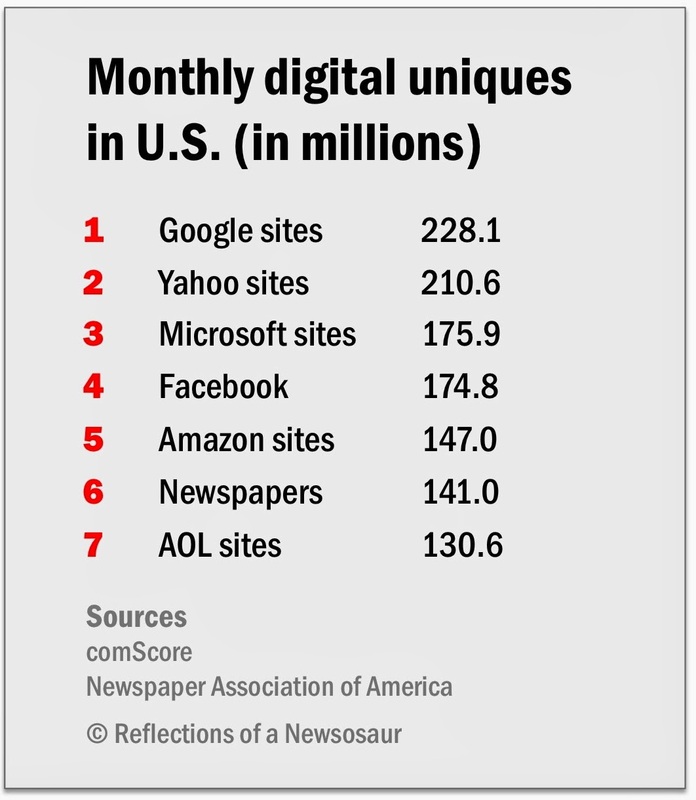 Based on data obtained from comScore, the Newspaper Association of America reports that 141 million individuals are consuming digital content from newspapers each month. With some 40 million homes taking print papers and more than one person often reading the same print edition, it is fair to assume that print readers represent a significant, but incalculable, percentage of the 141 million digital visitors cited by the NAA. While audience size certainly matters, the next question is how deeply visitors engage with newspaper websites, which is a good indication of their utility to users and, thus, their value to advertisers. 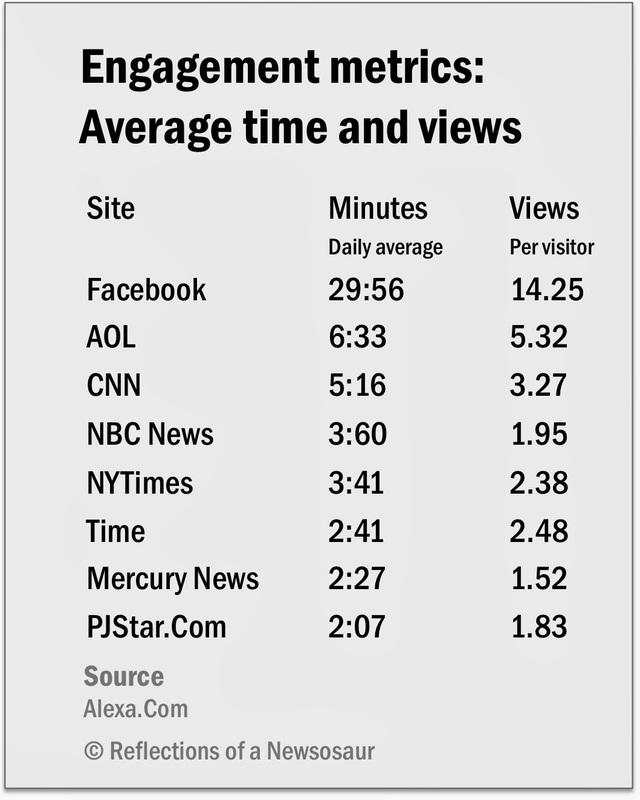 As illustrated in the next table, news (and most other) sites are not nearly as engaging as Facebook, where Alexa.Com reports that visitors on average spend nearly 30 minutes per session and consume an average of 14.25 page views per visit. 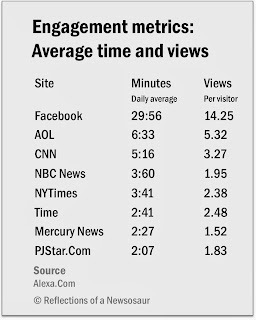 By comparison, visitors spend less than 4 minutes per session at the New York Times and NBC News sites. Engagement is even lower at local newspaper sites, as evidenced by the data below for the San Jose Mercury News, in the heart of Silicon Valley, and the Peoria Journal Star, in the heart of the nation. The biggest question of all is how well a digital publisher monetizes the eyeballs it attracts. The comparison is not easy, because traffic-grabbing sites like Google, Yahoo, Microsoft and Amazon draw their revenues from different sources than those pursued by newspapers – namely search, software sales and commerce. A comparison of the revenues among the three contenders shows that newspapers in 2012 generated $23.90 in advertising revenue per digital subscriber, as compared with $29.18 for Facebook and $10.72 in ad-only sales for AOL. While newspapers can claim to be competitive in attracting a large number of unique (but not necessarily deeply engaged) visitors for their digital products, the real problem is that their print business – which still delivers 75% of the industry’s total advertising sales (and perhaps 90%, if you count print circulation revenue) – has been contracting relentlessly for more than seven years. 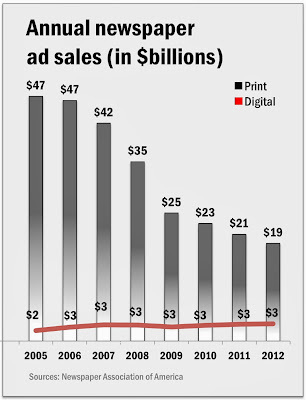 As illustrated in the next chart, print ad sales, which peaked at $47.4 billion in 2005, were only $18.9 billion in 2012, representing a 60% decline for the period. 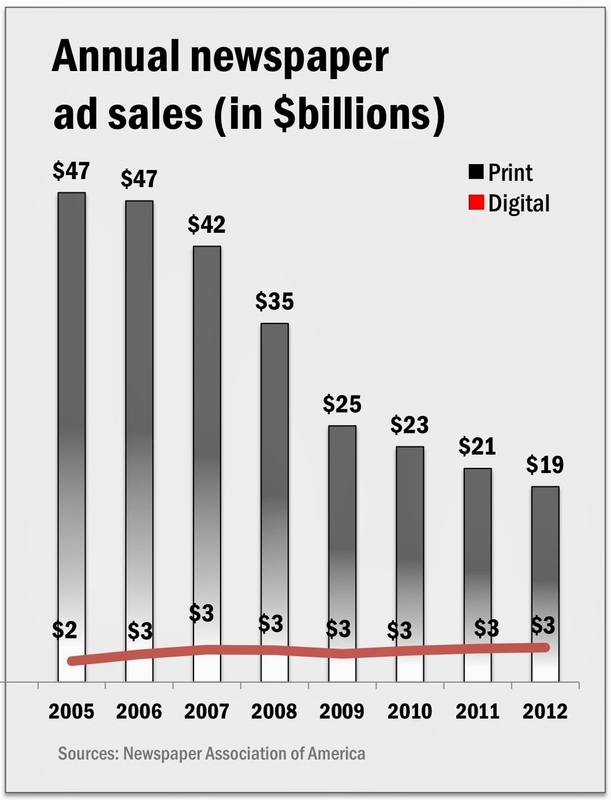 Meanwhile, digital ad sales grew 66% from $2 billion in 2005 to $3.4 billion in 2012. While robust, the rate of digital advertising gain at newspapers was barely a third of the 193% growth achieved by the over-all online industry, where the Internet Advertising Bureau reports that revenues surged from $12.5 billion in 2005 to $36.6 billion in 2012. The $27 billion drop in newspaper ad revenues between 2005 and 2012 is equal to the annual sales of more than five Facebooks. While newspaper revenues have fallen in every quarter since the first three months of 2006, Facebook just announced that its sales in the first nine months of this year surpassed the revenues for all 12 months of 2012. With aggregate revenues this year likely to remain comfortably north of $20 billion, the newspaper industry remains a substantial business. But it is less than half as substantial as it was a scant seven years ago. I often hear people say "I don't read newspapers or watch TV news anymore. I get all my news from Twitter (or Facebook)!" But what does that even mean? Twitter and Facebook don't have their own news divisions. Those links you see in your Twitter/FB feeds go to newspapers and magazines and TV network sites. Someone has to actually do the work. Unless people want to get all of their news from opinion blogs and other sites. I'd love to see all traditional media vanish just for one day, just to show people what will be lost when it does. Of course, we need to remember that many of the newspapers in the 1940s were absolute abominations. The Daily Mirror and the Evening Enquirer in NYC, for just two examples. And many, many papers were terrible and selling millions of copies daily. I think we all need to bear in mind that it wasn't like the U.S. population was all sitting around reading the New York Times and the Herald-Tribune. 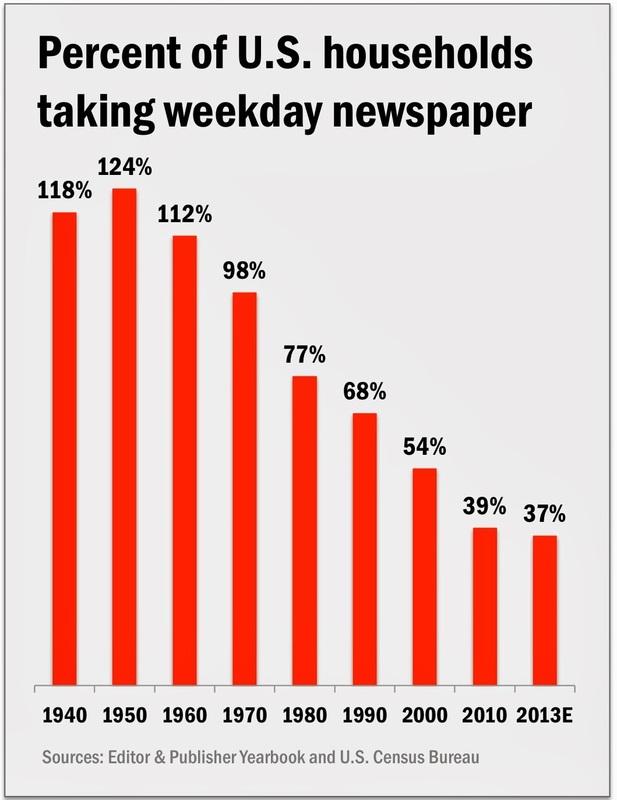 For the record, it was never the case that more than 100% of U.S. households took a weekday newspaper. The biggest drop - and this is before social media and the internet is from 1970 (98 percent) to 1980 (77 percent). The Newspaper Preservation Act was in 1970, and it led to the closing of many newspapers and the end to competition. Let's not just blame social media. Greedy owners had something to do with it too. Mary Anne, I don't know a lot about this history. Can you elaborate / explain this a bit more? Thanks for the comment. Me too, then we could get on with creating a real digital news & information operations, not these garbage afterthought operations run by old people who can't see past ABC print circulation numbers. Well, unless Google and Facebook start hiring their own news staffs, don't see how digital operations are going to pay for themselves. As long as Google, Facebook and the rest are leeching off the work of others to aggregate and exploit free content, nothing will change that model. One solution might be for all news orgs. to form their own consortium/aggregation site, and lease the news out to Google, etc., at a fair price, say $10 million a day. But that would be like herding cats to get all organizations to agree. Not saying newspapers aren't failing to move into the future. I think they don't have a realistic model to do so. So we are faced with a future of citizen journalists and corporate news in the form of press releases. Can't wait. You're assuming that all "news" is well-funded, investigative Journalism (called "capital-J Journalism" by an old editor of mine). It's not. Most of what lives in a "newspaper" today is shallow crap. Shoveled there by demoralized reporters on their second or third pay cut. Long gone are the days when you used a "newspaper" for virtually everything. Who uses a newspaper today for movie times, or to find a job, or for comics or for the random recipies? We have the Internet for that. The list of newspaper content that has been effectivly and completly replaced by the Internet is very, very long. Then there are whole genres of actual news content that have also been successfully supplanted by the web. To pick one example, for technology news and information there is no printed publication anywhere -- in the whole world -- that can come close the the breadth and depth provided by technology-oriented pure-digital operations. And I'm sure that's not the only example. So yes, the one remaining area that seeming only the "mass media" can provide: in-depth investigative journalism, is hard and expensive, and requires skill, determination and deep pockets to fulfill. But that's not what, by and large, newspapers are doing either. 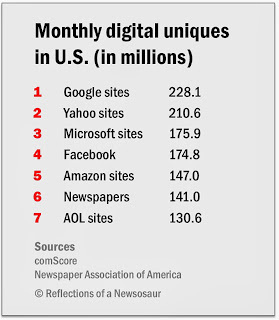 How many people really pay for digital news? How can they fire the photographers? Easy.